Battalion Experience events, helping prospective members prepare for upcoming auditions, will be held November 24-25 in Loveland, Colorado and December 8-9 in West Jordan, Utah. Auditions will be held January 5-6 in Draper, Utah and January 12-13 in the Denver area. 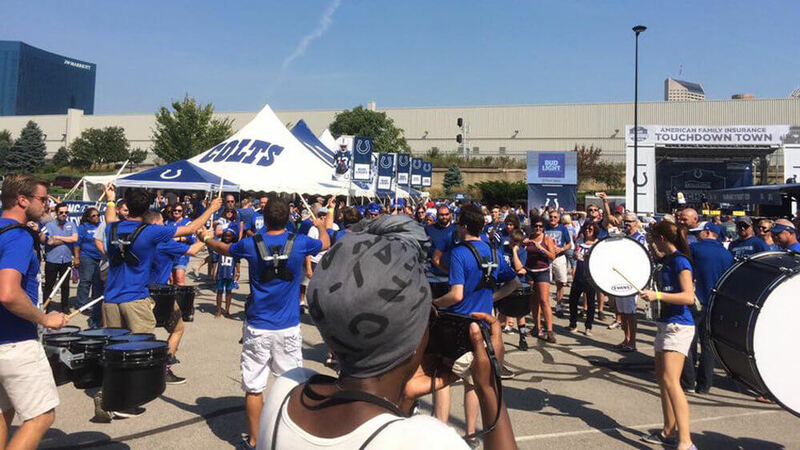 BD Entertainment has been introduced as the official drum line of the Indianapolis Colts for all NFL games in Lucas Oil Stadium. The 16 members of the line will perform for pre-game festivities as well as during the games, and will play on the same System Blue drums worn by the Blue Devils during the 2017 DCI Tour. The Blue Knights Percussion Ensemble, a competitive winter ensemble, is holding a pre-audition eductional clinic on Sunday, September 24 in Englewood. Colorado. The Crusader Golf Classic benefit is coming up on Friday, September 29 in North Attleborough, Massachusetts. Youth Education in the Arts, the parent organization of The Cadets, is looking to fill the full-time position of executive assistant. Carolina Crown is selling all of the flags utilized by the corps' 2017 color guard section. For a limited time, Cavaliers' 2017 “Men Are From Mars” merchandise is 40 percent off. The Crossmen added Atlanta, Georgia as a site for 2018 color guard auditions. Gold will be holding auditions December 16-17 in the San Diego area and January 6-7 in the Los Angeles area. Chris Tomsa, who has enjoyed a prolific four-decade career in drum corps, is returning to the Madison Scouts to lead the corps' 2018 brass program. Tim Snyder is the new brass caption head for the Mandarins, joining returning caption heads for the percussion, color guard, and the visual captions. Meet the members of Oregon Crusaders' color guard team. In addition to its full corps auditions in southern California, Pacific Crest has announced satellite brass audition camps on November 5 in Camarillo, California, November 19 in Lodi, California, and December 3 in Reno, Nevada. The RCR Winter Guard is returning to competition this year, starting with an educational open house/audition clinic September 24 at Centennial High School in Circle Pines, Minnesota. Sign up for Santa Clara Vanguard's eVanguardian e-mail newsletter, sent out every Thursday with the latest information and upcoming events within the Vanguard Music and Performing Arts organization. Spirit of Atlanta announced that Jeff Nelson has been appointed as the corps' new executive director. Nelson is the owner of Lone Star Percussion. Troopers have been selected as a charitable recipient of “Thankful Thursday,” an October 5 local auction that raises money for Casper-area non-profit organizations. Vanguard Cadets has five of its 2017 stage props to sell, ideal for a marching band or winter program.